Watch for Steve's articles in these upcoming magazines Also, listed below is Steve's weekly outdoor column featuring the latest in hunting and fishing information. 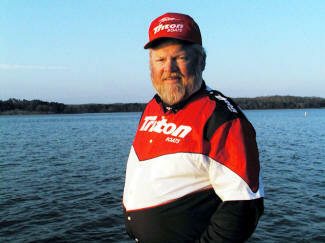 Each issue of CRAPPIE WORLD Magazine where Steve's regular column "PRO's POINTERS" helps you find and catch crappie. Catch Steve in each issue on national newstands. Steve's weekly outdoor columns appear each Friday in the Paris Post-Intelligencer newspaper in Paris, TN. From special feature stories on the great outdoors titled: Tales and Scales to short tidbits of news and info in his Shortcasts section. Log onto www.parispi.net and click on Sports icon and scroll down to Outdoors. You can subscribe to the Friday edition only and have the publication mailed right to your door. To subscribe call 731-642-1162 and tell them you want Steve's Friday outdoor page mailed to you each week! Additional tidbits, fishing updates, and articles from Steve are also posted at www.parislanding.com. Words don�t come easy this week. Last Friday night I had to say goodbye to an old friend and here at the McCadams� household we�re not quite over it yet. After some 13-years of friendship, trust, and unconditional love my old buddy Ace, a black Labrador retriever, took his last breath and headed to the big duck blind in the sky. After more than a decade of faithful service, time began to take its toll and the �old timer� fell victim to the ravages of old age where diminishing eyesight, hearing loss, and arthritis chipped away at this one-time athlete. His husky frame still reflected the stamina and physique of a veteran working dog but the years slowly robbed him of his once near perfect appearance and toned body. A graying muzzle chased away the jet black while the bock head and hefty chest remained as a reminder of what once was. I retired my old pal some four years ago after a great season full of memories and long retrieves. Many a mallard was softly deposited in my hand after a jaunting swim in bone chilling water. Together we saw many sunrises and logged countless hours in the great outdoors. It seemed all he wanted to do was be with me and please me. Labradors are like that. Four-legged, web-footed bundles of joy that come into your life and command a place in your heart. Ace traveled with me to the pheasant country of South Dakota, Iowa, and Nebraska. Together we treaded the gumbo mud of Arkansas� rice fields for ducks after switching over a few weeks prior from dove outings here in Tennessee. The river islands of Kentucky Lake,where I�ve hunted ducks for over 40-years, seemed to feel right at home for us. Over the years he found many cripples that attempted to get away in thick cover, only to fall victim to his desire and keen sense of smell. Sometimes he even stopped dead in his tracks and pointed, only to dive in after his prey with the thrust of a full back trying to make a first down. Thanks to his love and affection I have many memories to choose from and often wrote about him in this column and photographed him for several publications. He didn�t have any fancy titles from field trials but he was a champion in my book. My wife Linda and I have been under the spell of Labrador retrievers for many years. We�ve always treated them like members of the family. Their disposition is second to none and Ace was a gentle giant, looking deep into your soul with big brown eyes the way only a Labrador can do. A few years ago when I had a visit from an uninvited guest called cancer, my first day home from the hospital was spent pondering this hurdle in life. Helping me make the best of a bad situation was my pal whose nudges of the muzzle and wet tongues across the hand reminded me of how fortunate I was to have had his friendship. He seemed to sense something was wrong and was there to help. Prior to the surgery and bad news I had contemplated starting a pup, as he was a year or so past prime. Suddenly, the reality of the moment silently screamed the possibility that he was the one who might be there in the seasons ahead instead of me. Life has many sobering moments. Now, some seven years later I won my battle but the war goes on. Letting go has been hard. The next day after his death I was searching some of the same islands and bushes for winged mallards, just the way he and I had done for years. Every tree or willow break seemed to shout a memory. A big goose here or a pintail drake there. In-between tears I could sometimes see my old friend trotting toward me from the same spot, duck in mouth and as proud of it as a kid with a new baseball glove. After pausing on the island point and reliving some moments from yesteryear it was time for me to get back to a blind full of clients. Some have been with me long enough to have witnessed the old man and his feats, seeing first hand his mischief and talents along the sandbars of his life. Often I�d have customers call and ask about my canine companion. I suspect they knew of our bond. As breathing problems entered the picture over the last few weeks I could tell my old friend was coming to the end of life�s journey. Nothing I could do would stop the aging process, although I cut no corners over the last few years as to medications and medical attention. After all, it was the least I could do for a faithful friend. The last few years he knew when I headed out in the wee hours of the morning, shotgun case in hand, what my destination was. He often followed me to the truck door, the way he had for so many years only to be gently turned away back in the direction of his warm blanket of countless naps. His soul was willing, but the flesh was weak. Time is the best healer and it is through the young eyes of a young female black Labrador named Molly that I face each yell of an alarm clock these last few mornings. She�s a ball of joy and a chip off the old block. One of Ace�s pups from five years back, Molly has won our love and will carry the bloodline to another generation. A fitting reminder of her dad whose love helped me through good times and bad. Each retrieve she makes has a little bit of Ace there with her. And, did I mention she had brown eyes? Well, you know how it goes from here. Steve McCadams is a professional hunting and fishing guide here in the Paris Landing area. He has also contributed many outdoor oriented articles to various national publications.